Andok's Roasted Chicken has truly expanded and evolved. They now also sell bibingka. 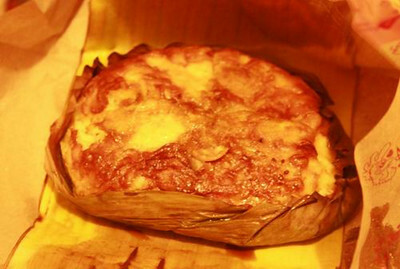 Bibingka is one of our many rice cakes that is most sought after during Christmas season. I actually don't eat it myself, just because, but hubby loves the stuff. And he loved the bibingka offered by Andok's very much, enough to insist I try it because if I didn't, I'd be missing half of my life. I still didn't try it but he said it was just really a perfect fluffiness of comfort and the best he's tried from different restos and kiosks. And because he's really not easy to please food-wise, I believe him. So, if you have balikbayan relatives you want to be impressing, just buy some of these stuff. It only costs P49.It's served/sold with the usual coconut shavings and muscovado sugar. Unfortunately, not all Andok's branches sell them. Hubby buys his from the branch near Waltermart in Makati. not a big fan of bibingka (i prefer the malagkit kind-- something like biko) but prolly trying this when i crave for one.